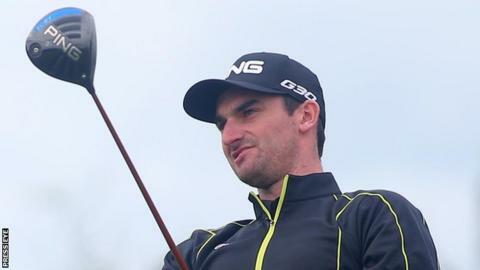 Chris Selfridge's hopes of staying on course for a European Tour card were wrecked as he was forced out of the qualifier in Valencia on Sunday. The Moyola Park pro had been on course to qualify for next week's Tour School after sharing fifth spot at the halfway point in the pre-qualifier at El Saler. But a wrist injury forced him to pull out before round three on Sunday. The other Ulster hopefuls in the various pre-qualifiers in Spain look to be facing exits. Alan Dunbar still has an outside chance of claiming a top-15 spot at Lumine in Tarragona. Dunbar shot a one-under 70 to move to four under par which is five shots outside the current likely qualification mark. Open Championship hero Paul Dunne also has work to do after a 71 left him sharing 25th spot two shots ahead of Dunbar while another Walker Cup player Gary Hurley is tied for 21st at the same venue on seven under. Caldwell's hopes are over at Panoramica in Castillon after a third-round 77 left him on four over and 14 shots outside the current qualifying mark. At the same venue, Warrenpoint man Colm Campbell is eight shots away from a qualifying position on two under after a 70 with Jack Hume also sharing 44th spot after his 72. Brian Casey is on course to progress to PGA Catalunya next week after his superb 64 left him in second spot at Panoramica on 19 under. Michael McGeady is six shots off a qualifying postion at El Saler after a 69 left him on two over while Richard Kilpatrick's hopes were extinguished after an 80 left him way off the pace on 10 over. Rory McNamara's prospects also appear to have faded at the Valencia venue after a 73 left him sharing 54th spot on three over.